When you’re opening a new business, one of the first things you think about is your exterior signage. When it comes to permanent signage, a building sign is a must if you have your own storefront. Whether you want channel letters or dimensional letters, the first thing we ask when you contact us for a building sign is how big you want it to be and what it will say. If you don’t know how big you want it to be, we can take measurements of the space you have to put the sign up to determine what would be the best size for your sign. Depending on how high up the sign is going to be, we might bring a ladder or our bucket truck to take measurements. 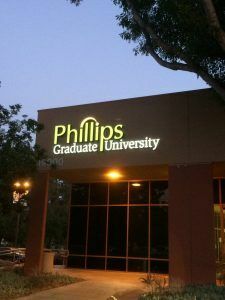 Another reason we do site surveys is to check how we will hook up a sign to electricity if you want an illuminated sign. There are two different ways we can mount channel letters; individually or on a raceway. When the channel letters are individually mounted, each channel letter is wired individually directly onto the wall. If there is not enough room to mount them individually, or if for whatever reason there is only one source of electricity that can be used for the sign, we can mount the sign with a raceway. A raceway is a rectangular box that we make from aluminum that we attach each letter on ahead of time. Each channel letter is wired within the raceway and the sign is installed as one piece. A very common piece of signage we make for businesses in plazas are monument sign panels. Monument signs refer to large signs that are installed near the street to advertise businesses to consumers driving or walking by. Tenant monument signs are those signs you see in plazas that list the many different businesses that are in that plaza. 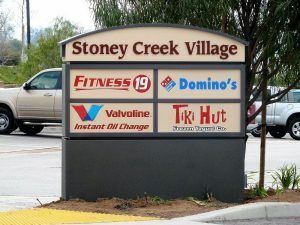 If you are moving into a plaza that has a tenant monument sign, you will most likely need to get a panel made along with your building sign for your storefront. As these signs are usually very large, we will send someone to do a site survey to measure the exact size your monument sign panel needs to be to make sure that it fits in the existing sign and looks great with the other businesses listed. If any installation is required, we will most likely do a site survey to make sure that our measurements are accurate before we start making your sign. Feel free to check out our website gallery to see some of our favorite signs that we’ve made and installed.